Media practitioners have been advised to always demonstrate high sense of professionalism and desist from being used as agents of disunity and foul play. The Director General of Yaman Support Group, an umbrella body for the Shuaibu Yaman Abdullahi campaign organisation, Hon. Olabode Towoju, in a statement issued on Monday described a rumoured attack by the reporter of Daily Trust in Kwara State, Mr. Romoke Ahmad, as falsehood and unfounded. Towoju said, "The reporter had demonstrated high level of incompetence and unprofessional conduct in her report " Breaking.... Yaman step down for Abdulrahman Abdulrazaq " which was published on Saturday 6th October 2018 at exactly 11:45 at the heat of the APC governorship primaries . "The report was not only condemnable, but was also used to mislead the general public in partial fulfilment of her cruelty deal with the money-bag politician aimed at garnering undue votes from Yaman supporters. The reporter went ahead to publish an untrue report without due consultation nor confirmation from the governorship aspirant or any of his aides." 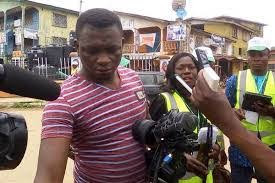 He added that, "Surprisingly, the false report went viral and generated controversies among supporters which prompted us to quickly go on air for radio announcement at seven minutes interval on Sobi FM 101.9, Ilorin. "Chased by her shadow, Romoke has been seen on social media platforms crying wolf and raising false alarm in order to cover up her misdeed and unprofessional conduct claiming that some suspected thugs of Yaman attacked her." The Director General however urged the acclaimed reporter to retrace her steps back to journalism school in order to get more knowledge and equip herself with the ethics of the profession so as to be fit for the job even as he advised the leadership of the Nigeria Union of Journalists, (NUJ) to watch out for the likes of Romoke and her co-travellers in order to protect the sanctity of the noble profession.